On Friday, Oct 7th we rearranged our apartment. Our bedroom became the new nursery and Reid’s room became ours. We didn’t know this was what we were going to do, but as Aaron and I were going through Reid’s things and deciding what we’d put away and what we’d keep out for his little brother to use I found myself struggling to imagine setting his room up for another child. I spent many days and nights in that nursery dreaming of what it would be like to see Reid in it, and when he didn’t come home with us on April 4th, 2015 I think a part of me already knew that no other child could fulfill that dream for me. There would never be an earth-side baby filling up that nursery. So with that decision made we started to take things down. The moon and stars wall decal that Aaron put up early last year for Reid and all of the elephants. It was emotional to go through these motions in reverse. That room had been Reid’s for so long that it was hard to change that space at all. But we had to make room for this second child of ours, and that is a beautiful thing. And over these past two months it’s been such a comfort to Aaron and I to sleep in Reid’s room. His rug and some of his wall hangings still remain in the bedroom, and every time my feet touch the floor and my eyes fall upon the reminders of our time with him a smile spreads across my face. So many memories are held within those 4 walls. Now the space that we’ve created for this second baby boy of ours is uniquely his own. His own four walls, his own décor, his own toys and clothes. Of course, there are hand-me-downs from his big brother and reminders of him all over the room, but the child that came before him does not overshadow him. He protects, inspires, and loves on this baby boy in so many gentle ways. This gallery wall was such a fun project for me – I just loved the process of going out and collecting or making each item. The bear with the sandwich is a personal favourite, and it’s something that my mom and grandma brought back from their trip to England in September. Then there’s the small leaf-patterned frame with Reid’s photo in it – I knew I wanted a photo of this baby’s big brother hanging above his crib and when I saw this frame I knew it was perfect for this. Then I drew inspiration from Winnie the Pooh for two things, one is a piece of artwork from one of the books and another is the adorable quote, “Let’s begin by taking a smallish nap or two…” In the middle, there’s a framed photo from our maternity session with Julie Christine Photography. She is amazing with maternity and lifestyle photos and we’re so grateful for all of the images of this special time that she captured for us. Then there’s the “dream big little one” sign, and that’s something that Aaron and I worked on together. He cut, glued, sanded, and stained the arrows and I hand-painted the lettering. It was a Pinterest DIY inspiration and I’m so happy with how it turned out! On the bottom left there’s the hanging plaque with a baby bunny squeezing a mama bunny, and that’s a piece that my mom found in a little boutique in Steveston, BC. And lastly, the mirror was a good ‘ol Home Sense find! Our rocking chair is by Stork Craft and it’s their Tuscany Glider and Ottoman in white/grey. I remember it took my mom and I forever to find a chair that worked with Reid’s nursery. Aaron and I have spent many hours in this chair over the years since purchasing it and we can’t imagine ever replacing it. It’s heard much laughter, seen many tears, and listened to countless children stories being read aloud. 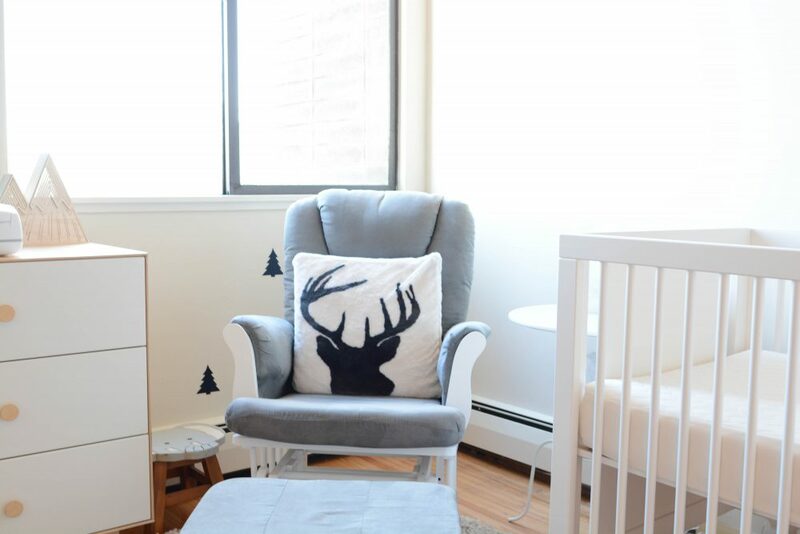 The moose silhouette pillow is a new addition though – I found it at Pottery Barn this winter. This is one of my favourite parts of the nursery. These are the shelves that Aaron made and I still can’t get over how beautiful they are. It’s so special that there is something handmade by this baby’s dad on display in his space. In the triangle shelf on the left we have one of the plant favours from baby boy’s shower in November. Then in the middle shelf there’s the book The Wish Tree, which inspired the relaxed, monochrome woodland theme for the nursery, a few Christmas beanie babies (because this Christmas baby needed a few decorations in his room! ), and the black and white stuffed animal which was a gift from my modeling agent, Liz Bell. She brought it all the way from South Africa! And it’s called a Long-Legged Friend, which is so appropriate for our baby and his 99th percentile femurs! And the shelf on the right has lots of inspiration from Reid. The Willow Tree statue which we were given by Micaela at Reid’s baby shower, a piece of artwork with full moons that my sister, Alana (you can check out her stunning artwork here), custom made in honour of Reid, and then the precious wooden moon phase mobile that I found on Etsy hangs from the bottom. These tree decals were another Etsy find and I love how they gave us the freedom to transform our rental apartment and make this room feel more unique to this child. 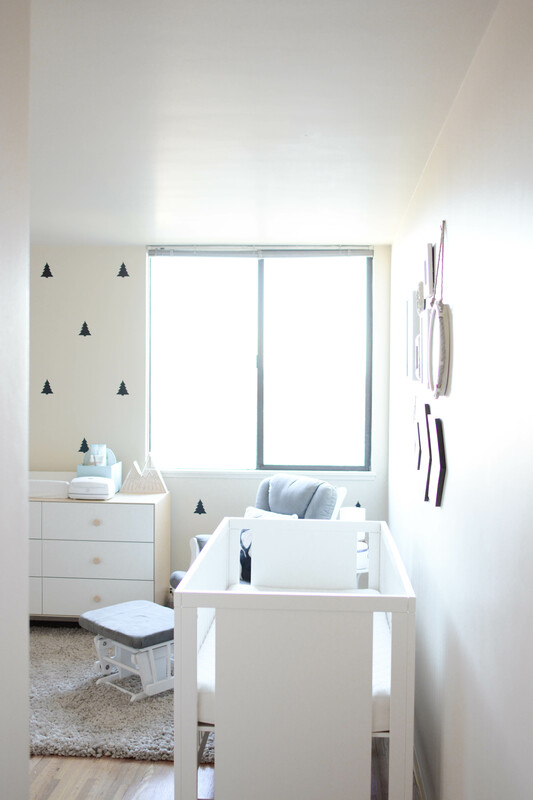 We chose to do one accent wall and it gives the nursery the perfect west coast touch! What would I have done without Marie Kondo’s magical folding methods? I was able to fit all of his adorable onesie’s in these drawers! This play gym was also purchased on Etsy. I wanted to stick with a natural wooden theme for most of the toys that would be on display in our home, and this one was perfect! I also love how the toys can be switched out down the road. So many of the kids books in our collection were gifted by my mother-in-law, who is a grade 5 school teacher. We were also blessed by a HUGE haul of new ones at baby boy’s shower in November. Can you believe that even though I didn’t register for any we didn’t get a single repeat? Reid’s baby album is on display in the nursery bookshelf. I started putting this together for him a couple of weeks before his birth once I was done with his room and then I finished it the night before the intimate celebration of life that we had for him in our home. It holds all of the beautiful memories we shared with him during pregnancy as well as the raw ones that came with his birth and I love having it there to look through. Now I’ve started to work on this baby boy’s album and I’m so glad that it’s one of the things that I’ve been able to do for both our sons. When I was pregnant with Reid I got this Boppy Nursing Pillow in Bare Naked and then purchased the chevron cover on Etsy. Now all that’s left to do is wait for this baby boy to make his journey earth-side. If you follow me on Instagram, you’ll know that we’re not exactly sure when that will be anymore since he has turned breech at the last minute. Since they can’t induce breech babies this means our December 19th induction won’t be possible if he stays head up. So we’re currently on a waitlist for a c-section and preparing for that option, which is the new plan unless he decides to turn head down again on his own! But after a lot of prayer and reflection we’ve made peace with this sudden change. Though it has long been a dream of ours to go through labour and birth as we did with Reid, but this time with a living child, we know that no matter which way this baby decides to be born or how his birth story unfolds as long as he is healthy it will be perfect in every way. C-section or vaginal delivery, both are birth and both can be so incredibly special for the whole family. And when he finally makes it safely into our arms and we get to bring a child home for the first time, this room is here and ready to host the memories of this next chapter in our lives.